Kaneff Centre 3359 Mississauga Rd. Has consulted for the World Resource Institute, an environment think-tank in Washington. Won best paper awards in Administrative Sciences Association of Canada Conference and Accounting & Finance Association of Australia and New Zealand Conference. He has been invited to present his research papers in many universities in North American as well as in Hong Kong, Japan, and China. 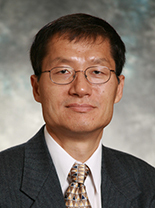 He has served as a visiting associate professor at the Ivey School of Business, the University of Western Ontario, and the School of Accountancy, Chinese University of Hong Kong. His research examines how accounting information and corporate disclosures affect market valuation of the firm. His particular area of expertise is in corporate disclosure of environmental information. Serves on the editorial board of Contemporary Accounting Research (2010), Advances in Environmental Accounting and Management. Has published in the leading accounting research journals, including the Accounting Review, Accounting, Organizations and Society, Contemporary Accounting Research, Journal of Accounting, Auditing and Finance, among others. His research has been presented in international conferences such as American Accounting Association Conference, Canadian Academic Accounting Association Conference, Financial Management Association Conference, Contemporary Accounting Research Conference, and Journal of Accounting, Auditing and Finance Conference.